make the trip. The water seems endless and the view is spectacular from anywhere. Judging by the thousands of boats that we saw, I guess the fishing must be good here as well! My Uncle David drove up from Winnipeg to walk with us for the day and had dinner with us as well. 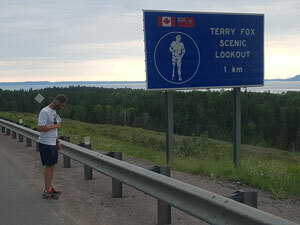 Discussing our route, he mentioned that Highway 11 which we were taking from Nipigon to North Bay was a primary big truck route. That shot down my idea of having less traffic for us, oh well we will make it work. As we continued on our journey, the lakes just continued to increase in quantity, around every corner, over every hill there was another lake, most had their shorelines scattered with cottages, which really got me thinking… It’s time for some lake life and a cottage. Knowing that Ontario was going to be the longest stretch of the trip and the most remote once we hit Nipigon and headed north on Highway 11 we made sure to take some time to enjoy the people and the sights along the way, even stopping at a few picnic areas right on the edge of a lake, for a lunch break. Nothing like enjoying a bite to eat in the warmth of the June sun with your feet soaking in the water. 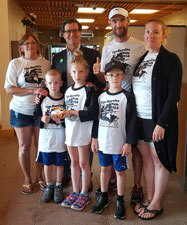 Following that we were presented with the medallion of Thunder Bay from the acting Mayor Frank Pullia which was an awesome experience! 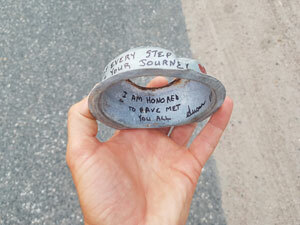 In Thunder Bay on day 55 we decided to take our first rest day of the trip. Up until now we had had a few early days with an afternoon off but this was our first full-blown day off. 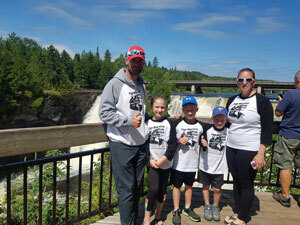 We did the tourist thing for most of the day and went to see Kakabeka Falls, a favourite spot when we travelled through as kids. 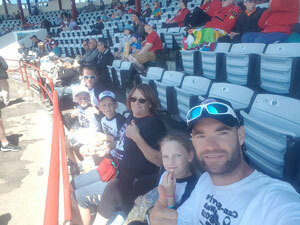 Then we were fortunate enough to be invited to a Thunder Bay Border Cats Baseball game, where Dylan got to sing the National anthem and the boys both got to use their new Blue jays gloves and throw in the first pitch. What a great experience for them and us as parents. I barely got in 5,600 steps that day. 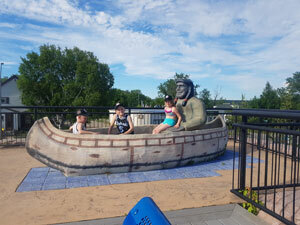 Nipigon had a story about ‘Paddle to the Sea’ that you read and then walk through town to follow along with the story as a bit of history for the area, the kids really enjoyed that. A neat little town, with some interesting history. Nipigon was also home to Canada’s smallest Canadian Tire store which was really neat. This was going to be the last time that we received a surprise from our friend Susan the cyclist as she was heading south on highway 17 and we were going north on 11, perhaps we will catch up again soon!